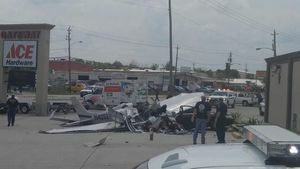 Three people were killed when a small plane crashed near Hobby Airport Thursday afternoon. According to the Houston Fire Dept., at 1:12 p.m. the plane crashed at 6800 Telephone Road, just northwest of Hobby Airport. HFD Units arrived to find a small single engine plane down in a parking lot that had struck a parked vehicle. This was declared under control by HFD at 1:22 p.m.